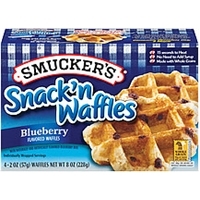 SMUCKER'S® SNACK 'N WAFFLES BRAND BLUEBERRY FLAVORED WAFFLES. NEW! 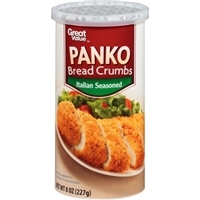 MADE WITH WHOLE GRAINS. 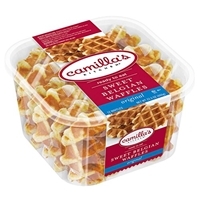 WITH NATURALLY AND ARTIFICIALLY FLAVORED BLUEBERRY BITS. INDIVIDUALLY WRAPPED SERVINGS. 15 SECONDS TO HEAT. ALREADY SWEET. 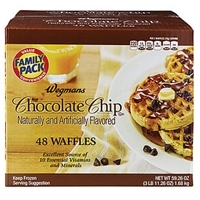 WHOLE GRAIN 16G OR MORE PER SERVING. EAT 48G OR MORE OF WHOLE GRAINS DAILY. WHOLEGRAINSCOUNCIL.ORG. 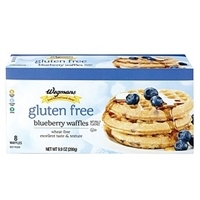 Whole wheat flour, sugar, enriched unbleached flour (wheat flour, malted barley flour, niacin, iron, thiamin mononitrate, riboflavin, folic acid), canola oil, nonfat milk, eggs, flavored blueberry bits (powdered sugar, dextrose, dates, corn syrup solids, modified corn starch, glycerine, partially hydrogenated vegetable oil [sunflower (with added tocopherol) or cottonseed and soybean oil], rice flour, elderberry juice concentrate [color], water, natural and artificial flavors, citric acid, caramel color), fructose, yeast, contains 2% or less of: fully hydrogenated cottonseed oil, salt, natural flavors, carrot fiber, monoglycerides, enzymes (with wheat). 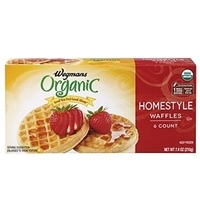 Water, organic whole wheat flour, organic enriched wheat flour (organic wheat flour, niacin, reduced iron, thiamin mononitrate [vitamin b1], riboflavin [vitamin b2], folic acid), organic vegetable oil (organic canola and/or organic soybean oil), organic cane sugar, contains 2% or less of: leavening (sodium acid pyrophosphate, sodium bicarbonate, monocalcium phosphate), organic brown rice flour, organic corn flour, organic oat bran,, organic barley flour, organic dark rye flour, organic soy lecithin, organic wheat bran, organic skim milk, organic eggs, sea salt. 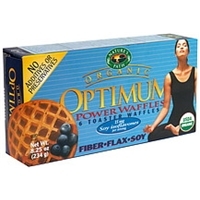 Brand/Manufacturer: nature's path power waffles Nature's Path Foods, Inc.
Water, organic white wheat flour, organic whole wheat flour, organic flax seed, organic blueberries, organic evaporated cane juice, organic expeller pressed soybean oil, leavening (sodium acid pyrophosphate, sodium bicarbonate, monocalcium phosphate), organic pear juice, organic soylife, organic oat bran, natural blueberry flavor, non gmo soy lecithin, sea salt, rice bran extract. 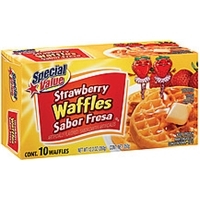 Water, brown rice flour, potato starch, corn flour vegetable oil (canola and/or soybean oil), tapioca starch, sugar, inulin, potato flour, contains 2% or less of: leavening (sodium acid pyrophosphate, sodium bicarbonate), soy lecithin, fruit juice concentrate blend (pear juice concentrates), natural flavor, salt. 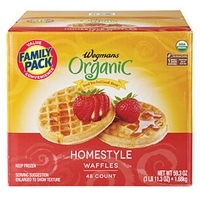 Water, organic whole wheat flour, organic enriched wheat flour (organic wheat flour, niacin, reduced iron, thiamin mononitrate [vitamin b1], riboflavin [vitamin b2], folic acid), organic vegetable oil (organic canola and/or organic soybean oil), organic cane sugar, contains 2% or less of: leavening (sodium acid pyrophosphate, sodium bicarbonate, monocalcium phosphate), organic wheat bran, organic soy lecithin, organic pear juice concentrate, organic skim milk, organic eggs, sea salt. 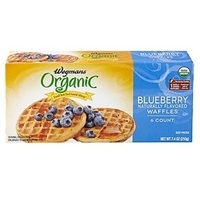 Water, brown rice flour, potato starch, corn flour vegetable oil (canola and/or soybean oil), tapioca starch, blueberry bits (sugar, palm oil, corn flour, dextrose, corn starch, natural flavor, fruit and vegetable extracts, dried blueberries). 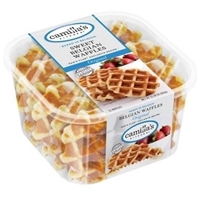 Sugar, contains 2% or less of: inulin, potato flour, leavening (sodium acid pyrophosphate, sodium bicarbonate), soy lecithin, fruit juice concentrate blend (pear juice concentrates, pineapple syrup, clarified pineapple and peach juice concentrates), natural flavor, salt. 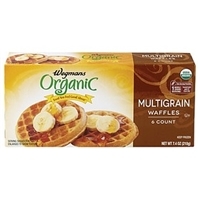 Water, organic whole wheat flour, organic enriched wheat flour (organic wheat flour, niacin, reduced iron, thiamin mononitrate [vitamin b1], riboflavin [vitamin b2], folic acid), organic vegetable oil (organic canola and/or organic soybean oil), organic blueberry bits (organic powdered sugar, organic corn flour, organic palm oil, vegetable extract for color [purple carrot, red cabbage], organic natural flavor, organic blueberry powder), organic cane sugar, contains 2% or less of: leavening (sodium acid pyrophosphate, sodium bicarbonate), organic pear juice concentrate, organic wheat bran, organic soy lecithin, organic skim milk, natural flavor, organic eggs, sea salt. 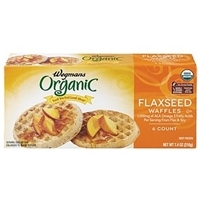 Water, organic enriched wheat flour, (organic wheat flour, niacin, reduced iron, thiamin mononitrate [vitamin b1], riboflavin [vitamin b2], folic acid), organic whole wheat flour, organic vegetable oil (organic canola and/or organic soybean oil), organic cane sugar, , whole and ground organic flax seeds, contains 2% or less of: leavening (sodium acid pyrophosphate, sodium bicarbonate, monocalcium phosphate), organic soy lecithin, organic skim milk, organic wheat bran, organic eggs, sea salt. 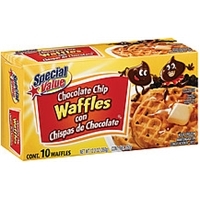 Enriched wheat flour (wheat flour, niacin, reduced iron, thiamin mononitrate [vitamin b1], riboflavin [vitamin b2], folic acid), whey, vegetable oil (canola and/or soybean oil), sugar, semichocolate chips (sugar, unsweetened chocolate, cocoa butter, soy lecithin [emulsifier]), contains 2% or less of: eggs, leavening (sodium acid pyrophosphate, sodium bicarbonate), soy lecithin (emulsifier), natural and artificial flavors, calcium carbonate, salt, vitamin a palmitate, niacinamide, reduced iron, pyridoxine hydrochloride (vitamin b6), riboflavin (vitamin b2), thiamine mononitrate (vitamin b1), folic acid, vitamin b12. 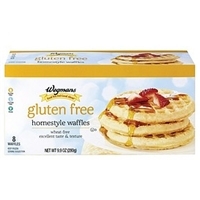 ENRICHED WHEAT FLOUR (WHEAT FLOUR, MALTED BARLEY FLOUR, NIACIN, REDUCED IRON, THIAMIN MONONITRATE, RIBOFLAVIN, FOLIC ACID), MARGARINE (PALM OIL, PALM FRACTIONS, WATER, SALT, SOY LECITHIN AND DISTILLED MONOGLYCERIDES [EMULSIFIERS], NATURAL BUTTER FLAVOR, CITRIC ACID, MIXED TOCOPHEROL [ANTIOXIDANT, SOY DERIVED], VITAMIN A, AND BETA-CAROTENE [FOR COLOR]), SUGAR, WATER, WHOLE EGG, INVERT SUGAR, YEAST, DEFATTED SOY FLOUR, SALT, VITAL WHEAT GLUTEN, SOY LECITHIN, ARTIFICIAL VANILLIN. WHEAT FLOUR, SUGAR, MARGARINE (PALM OIL, COCONUT OIL, WATER, CANOLA OIL, SUNFLOWER LECITHIN AND MONO-AND DIGLYCERIDES OF FATTY ACIDS [EMULSIFIER], SALT, CITRIC ACID, BETA-CAROTENE [FOR COLOR], NATURAL FLAVOR), WATER, WHOLE EGG, INVERT SUGAR, YEAST, SOY FLOUR, SALT, SOY LECITHIN, NATURAL VANILLA FLAVOR.